It’s time for Chocolate and Wine! Chocolate and Wine Weekend along the Seneca Lake Wine Trail is here! 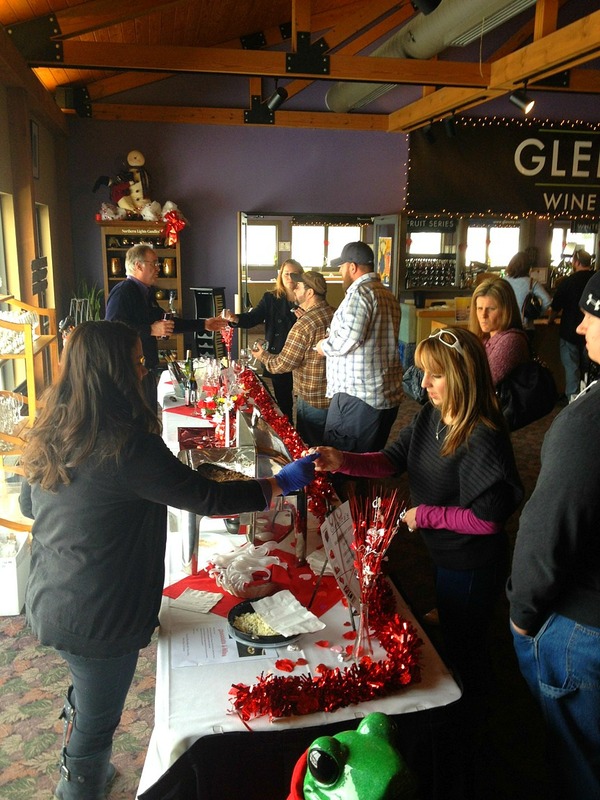 Seneca Lake Wine Trail events offer visitors the opportunity to enjoy a self-guided tour around Seneca Lake, stopping at member wineries to sample various treats. In this case, chocolates or foods prepared with chocolate, creatively paired with wine. Our Retail Shop staff always has a ball transforming the tasting room to reflect the theme of each weekend. For instance, stop by for Cruisin’ the Tropics in March and you will feel like you’re in a tropical oasis, complete with a dock and tiki huts. This weekend, since Valentine’s Day is approaching, it seemed only right to decorate as such. 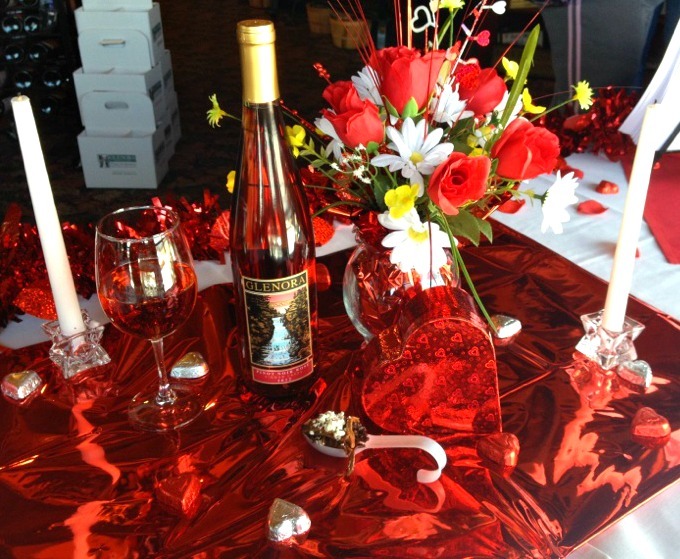 Who doesn’t love a little chocolate and wine on Valentine’s Day anyway? You will see plenty of red and pink décor with white accents, and of course, plenty of chocolate to go around. I was able to have a taste before the event started and the combination of flavors is just delightful. Chocolate and port have long been a wonderful pairing and the combination of the two in the sauce is rich, without being heavy. The meat simply melts in your mouth. The full flavors of our port with just a hint of chocolate make the sauce a decadent accompaniment to the tender, creamy meat. We have a few choices of wine pairings for guests to choose from, but personally, I enjoy the shortribs paired with our 2012 Pinot Noir Rosé; a light and crisp, semi-dry wine with flavors of strawberries. The Pinot Noir Rosé brings out the rich berry flavors of the Port, while complementing the chocolate and chevre beautifully. If you don’t have a chance to visit us this weekend, I highly suggest trying your hand at this recipe – you won’t be disappointed! Preheat oven to 350°. Season short ribs with salt and pepper. Heat oil in a large Dutch oven over medium-high heat. Working in 2 batches, brown short ribs on all sides, about 8 minutes per batch. Transfer short ribs to a plate. Pour off all but 3 Tbsp. drippings from pot. Add onions, carrots, and celery to pot and cook over medium-high heat, stirring often, until onions are browned, about 5 minutes. Add flour and tomato paste; cook, stirring constantly, until well combined and deep red, 2-3 minutes. Stir in wine, then add short ribs with any accumulated juices. Bring to a boil; lower heat to medium and simmer until wine is reduced by half, about 25 minutes. Add all herbs to pot along with garlic. Stir in stock. Bring to a boil, cover, and transfer to oven. Cook until short ribs are tender, 2–2 1/2 hours. Transfer short ribs to a platter. Strain sauce from pot into a measuring cup. For the sauce: Melt chocolate chips in a double-boiler. In another pan, bring the port wine to a boil to burn off alcohol and reduce slightly. Once the flames have died down, pour the wine into the chocolate. While whisking, slowly add the chevre and liquids in increments. Taste for seasoning. Pour the sauce over the shortribs to finish. My name is Hallie Weakland and I am the Marketing Coordinator of Glenora Wine Cellars, as well as, the author behind many of our blog posts. As a native of the Finger Lakes, I have experiences in many facets of the wine and tourism industry in the region, from waiting tables at regional fine dining restaurants (Veraisons being one) to working in one of the local museums. While I’ve always been an ambassador of the Finger Lakes and its many offerings, I officially began my career in marketing with Finger Lakes Wine Country Tourism Marketing Association, which led me here to Glenora! I’ve been a member of the Glenora team since November and previously, as a server, since 2008. In my free time, I like to travel, spend time with family and friends, cook, enjoy good food and wine, and do practically anything that involves the great outdoors! ← Tasting Menu – Demystified!